Brazil footballer Kaka was named FIFA World Player of the Year in 2007. The 25 year old Brazilian beat Barcelona forward Lionel Messi and Manchester United player Christiano Ronaldo in the annual poll of national team coaches and captains. 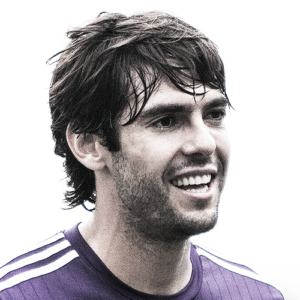 Ricardo Izecson dos Santos Leite (born April 22, 1982 in Brasília), better known as Kaka, was born on April 22, 1982 in Brasilia. Kaka made his debut at Sao Paulo FC in 2001 when he was 18 years old. In the first season, he scored 12 goals in 27 appearances, and 10 goals in 22 appearances in the following season. His performance attracted attention from European clubs. He joined AC Milan in 2003 for $8.5 m. He scored 10 goals in 30 appearances that season, winning the Italian Serie A Championship and the European Super Cup. During the 2004-05 season, he was voted the best midfielder of the Champions League tournament. Kaka made his international debut in January 2002 against Bolivia. He was a part of the national squad which won the 2002 FIFA World Cup, but did not see much action playing just 19 minutes of the first round match against Costa Rica. He scored Brazil’s first goal in the 2006 FIFA World Cup against Croatia on 13 June 2006. He was, however, unable to carry his momentum into the next matches and Brazil were eliminated by France in the quarter finals. 2007 was the most prolific of his stellar career to date. During this season he helped his club AC Milan win the UEFA Champions League, The FIFA Club World Cup and the Ballond’Or.